From the buzz of activity in the East China Sea to the relative quiet of Somalia’s piracy afflicted waters, a new map has revealed the world’s shipping activity in mesmerising detail. The interactive map provides a fascinating glimpse into hows these shipping vessels navigate through vast oceans as they bring their valuable cargoes to port – but it also serves a more serious purpose. 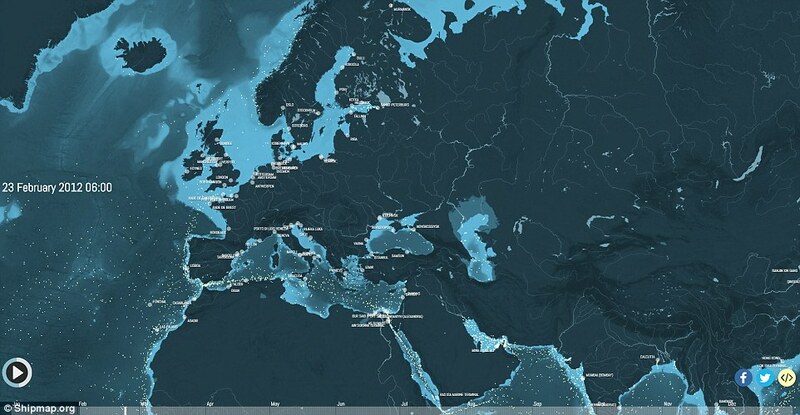 Researchers want the map to shed light on just how large a carbon footprint is created by the world’s cargo ships. It is estimated that a single large container ship can emit pollutants equivalent to that of 50 million cars. The issue we were following was the levels of greenhouse gas emissions from cargo ships and their pollution impact,’ Tristan Smith, a reader at University College London’s Energy Institute, told Motherboard. The data points show the movements of the world’s commercial shipping fleet over the course of 2012. It also shows their fuel consumption every hour. Shipmap’s website says that ‘billions of tonnes of ships and cargo rely on burning massive quantities of bunker fuel’. This results in the release of huge amounts of carbon dioxide, which is the main driver of global warming. Emissions from international shipping for that year were estimated to be 796 million tonnes CO2 which is more than the whole of the UK, Canada or Brazil emit in a year. That’s 2.18 million tonnes CO2 per day or 90,868 tonnes CO2 per hour. To create the map, researchers at UCL Energy Institute and Kiln estimated emissions from five different ship types and plotted 250 million data points. Based only on ship movements and without a background map, the world’s coastlines are clearly defined, with plenty of variation in ship activity, including in areas you might not expect them, such as the Arctic and Antarctic. 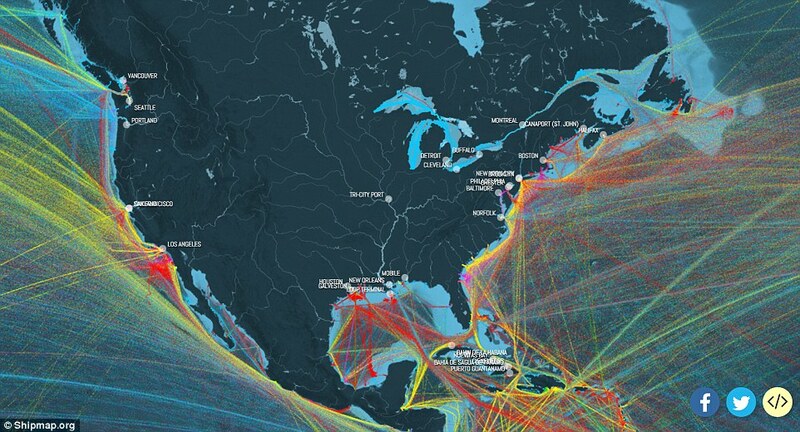 The map clearly shows the most crucial shipping thoroughfares of all: the canals linking different bodies of water, such as the Panama Canal, which opened a century ago to connect the Atlantic and Pacific Ocean. It also shows the even older and busier Suez Canal which saw 17,000 transits in 2012 alone. To observe the flows of the global economy in more detail, users can distinguish between five different ship types. 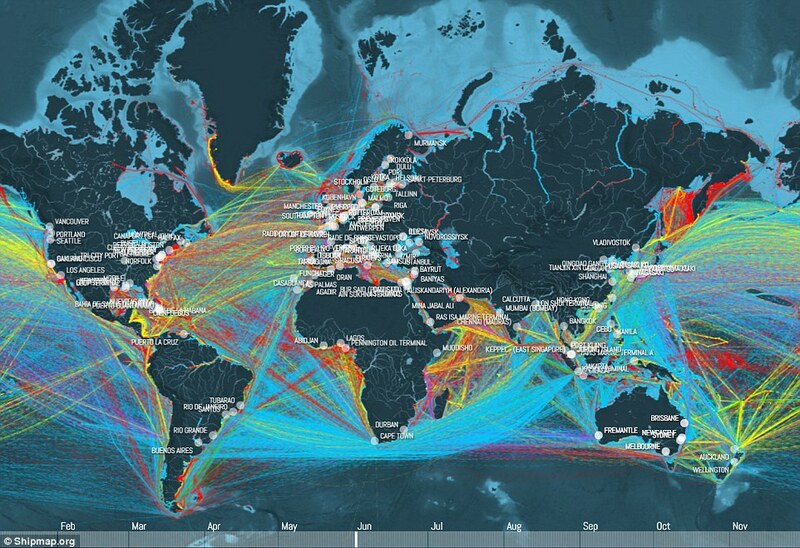 The red dots represent huge tankers, the blue dots show dry bulk ships that move cargo like ores, and the yellow dots show ships that carry manufactured products. Green shows gas bulk and purple shows ships carrying vehicles. It clearly shows the movements of tankers which ship oil from massive terminals in the Middle East or from offshore rigs in West Africa and elsewhere. It also shows dry bulk carriers moving aggregates, ores and coal from mines and quarries, many of which are found in Australia and Latin America. Many of these raw materials are shipped to manufacturing regions to make finished goods which are themselves moved back across the ocean in container ships. 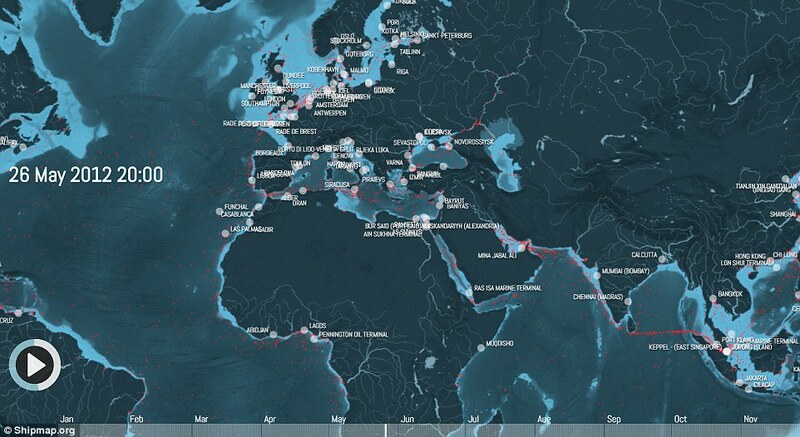 UCL-Energy researchers estimated that the map shows roughly 50,000 cargo ships, some of which are over quarter of a mile long. The next step, they say, is to update their map based on newer data. Shown here are the major European pots with the red dots representing huge tankers. The map clearly shows the movements of tankers which ship oil from massive terminals in the Middle East or from offshore rigs in West Africa and elsewhere. Over 15,000 diesel-powered vessels could be forced to use fuel with 90 per cent less sulphur, after a trial found the cleaner alternative had no impact on vessels’ mechanics or consumption, under a government proposal. However, some operators fear that the cleaner diesel will push up their running costs – despite government assurances to the contrary. The proposal will be tabled to the legislature this year and will force operators of vessels, including ferries, high speed boats, barges, tug boats and cross border vessels, to use diesel containing no more than 0.05 per cent sulphur from 2014. The cap is 10 times stricter than the current 0.5 per cent limit on sulphur in marine diesel. However, the upgraded fuel still has 50 times more sulphur than the Euro V diesel being used for road transport. That diesel only has 0.001 per cent sulphur. In a paper submitted to lawmakers yesterday, environment officials said a trial completed in January this year found the cleaner fuel would not damage older engines. The trial, conducted by University of Hong Kong specialists, also confirmed there was no significant change in fuel consumption or power output after the switch. Officials said there would not be a substantial difference in costs, as their most updated figures showed the low sulphur diesel was just seven cents per litre more expensive. They quoted oil companies’ forecasts that the price differential could be even narrower in the future. Johnny Leung Tak-hing, general manager of Star Ferry, however, remained sceptical over the fuel costs. “The industry is worried whether the seven cents difference is true or not … we hope the government can give us more guarantees and data to support their claims,” he said. Leung said the government had also tested local vessels on ultra low sulphur diesel, which had a sulphur content of 0.005 per cent in 2001 but concluded that it was too expensive. The government at that time pledged the ultra-low-sulphur diesel would cost just 20 cents more per litre, but the difference rose to around HK$1 eventually, he said. Officials said the fuel market was a free one and there was nothing the government could do to control price setting. Leung also said some diesel vessel operators also wanted the government to subsidise them replacing old engines. “The road transport operators are given subsidies to replace their vehicles. But we have got not even a single cent,” he said. The Environmental Protection Department estimated that the switch could reduce sulphur dioxide emissions by 3,219 tonnes a year, representing a 19 per cent reduction of the marine sector’s total emissions in 2011. The marine sector, including ocean-going vessels, has overtaken power plants as the largest source of sulphur dioxide, nitrogen oxides and respirable suspended particles.